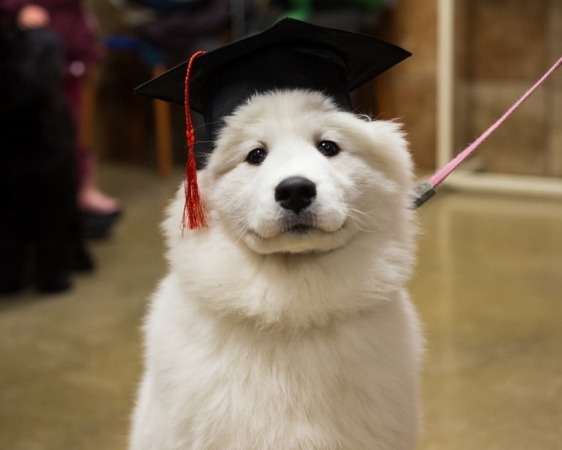 Taylor at her Obedience graduation class. 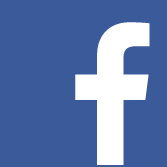 Welcome to our home on the web. 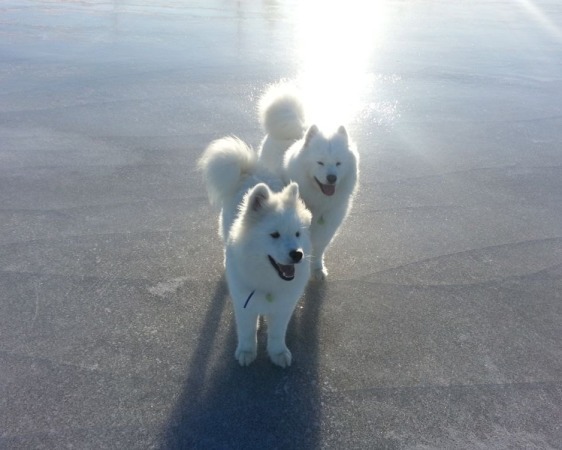 We hope you will enjoy your visit and introduction to some of our dogs. 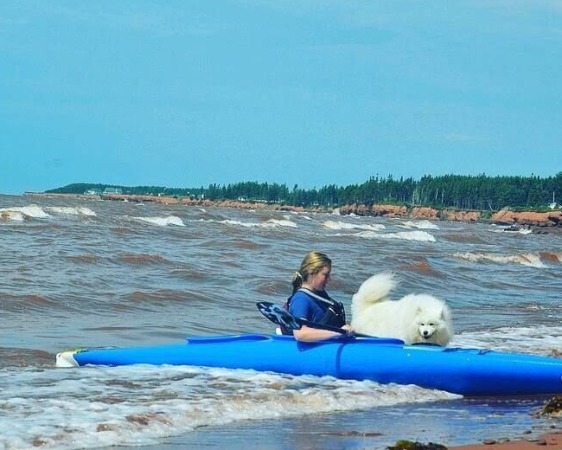 We are Margaret and John MacFadden who have a kennel located in Bonshaw, Prince Edward Island, Canada,about 20 minutes west of the provincial capital of Charlottetown. Our kennel has been at this location for over 20 years. 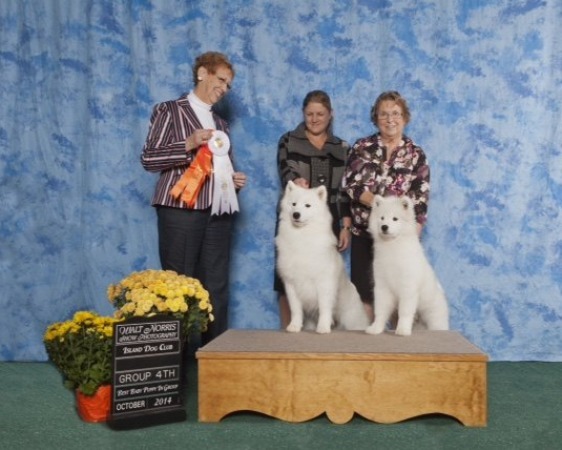 Our goal is to produce beautiful, healthy and sound Samoyeds that excel in breed type. 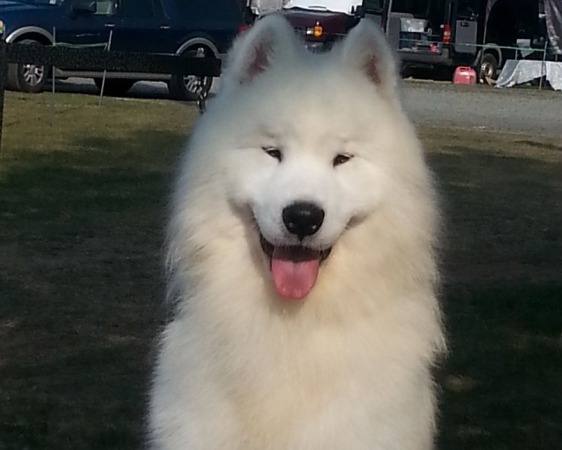 Our Samoyeds make wonderful family, therapy and show / breed companions. 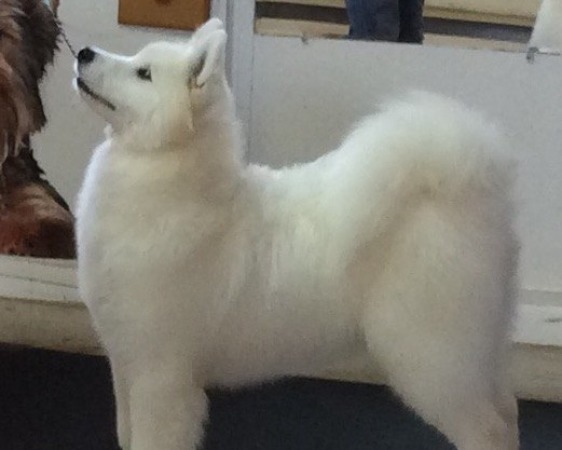 They are true to breed type and what a Sam should be. 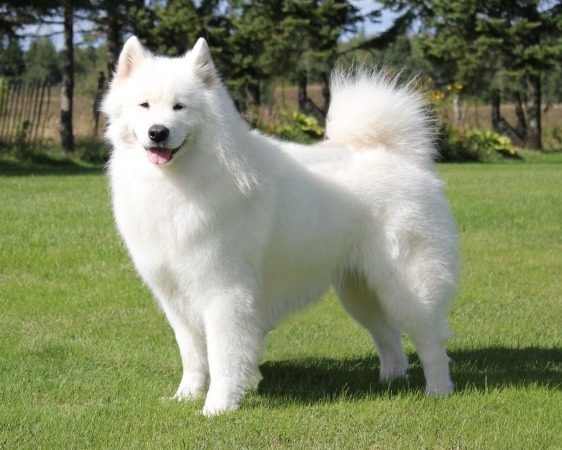 Incidentally, for those of you who may be under the impression that the Samoyed breed is "hypoallergenic" (relatively unlikely to cause an allergic reaction) .... that is a myth. 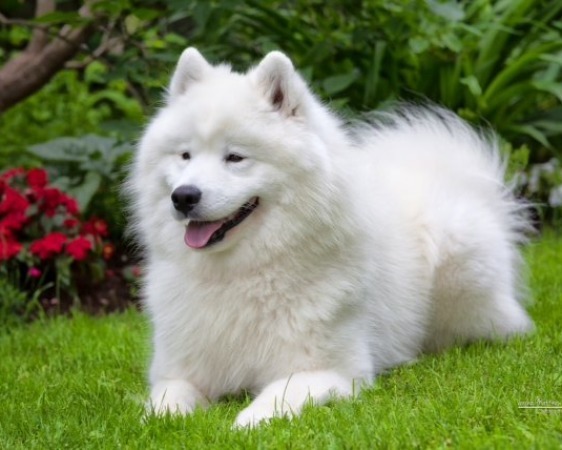 The Samoyed is not a hypoallergenic breed. 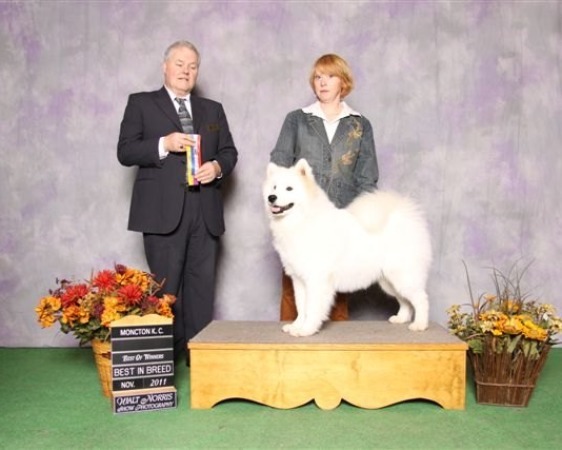 We are very active in the sport of purebred dogs and extremely proud of the success we have had with our homebred Samoyeds. 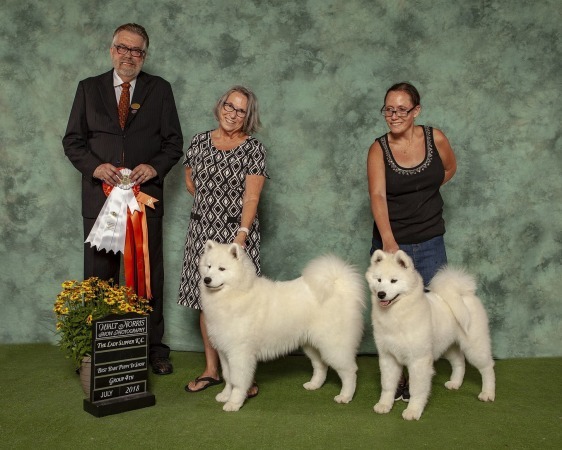 We are very proud to say that Margaret has bred, owned and handled our dogs to many Best in Shows, Multi-Best in Shows, Group and Best of Breed wins. 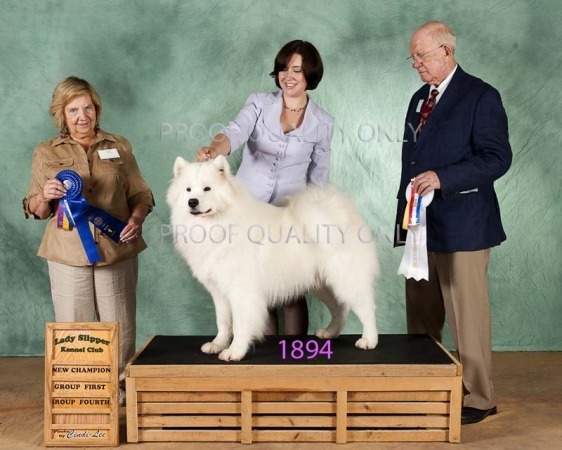 Obedience titles have also been earned by many of our dogs. 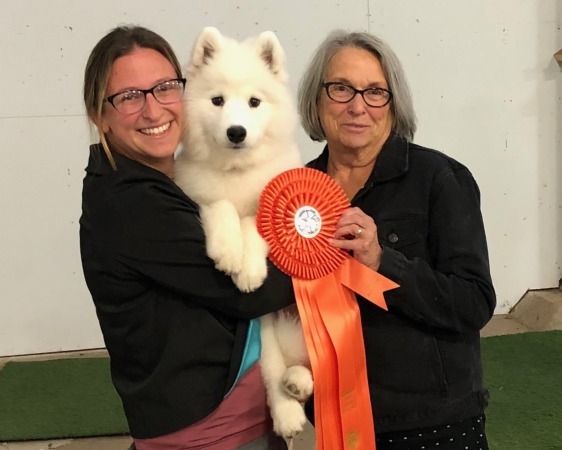 Our Snowstar's Cirque du Kooza has recently earned three consecutive High in Trail awards to earn his Companion Dog title. 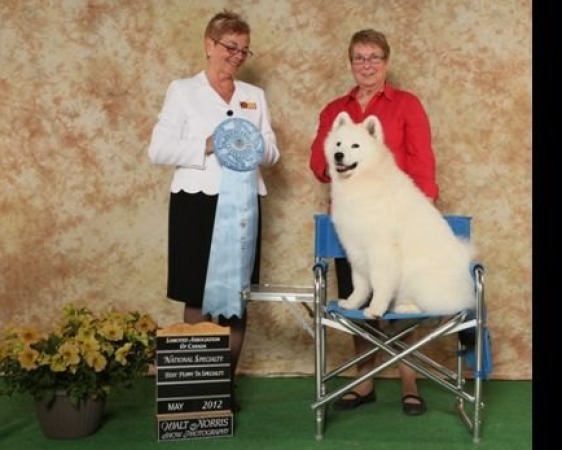 We are members in good standing of the Canadian Kennel Club and Marg is a member of the Samoyed Association of Canada and the Samoyed Club of America. 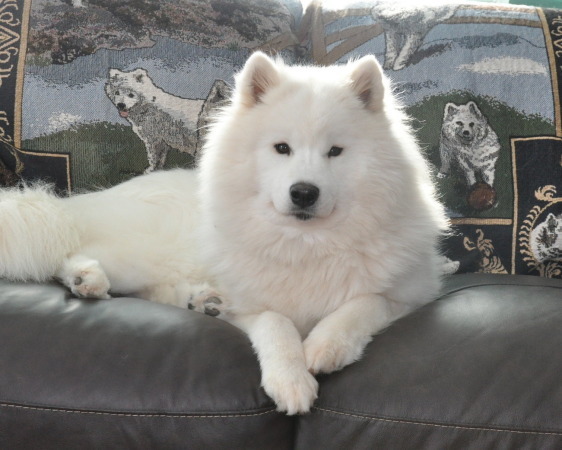 We have also been very involved in Samoyed Rescue in both Canada and the United States. 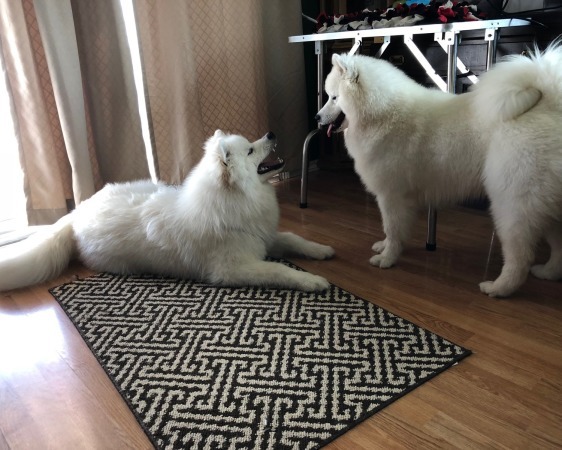 All of our dogs are raised in our home, underfoot, to ensure they are exposed to the comings and goings of family life and that they are correctly socialized. 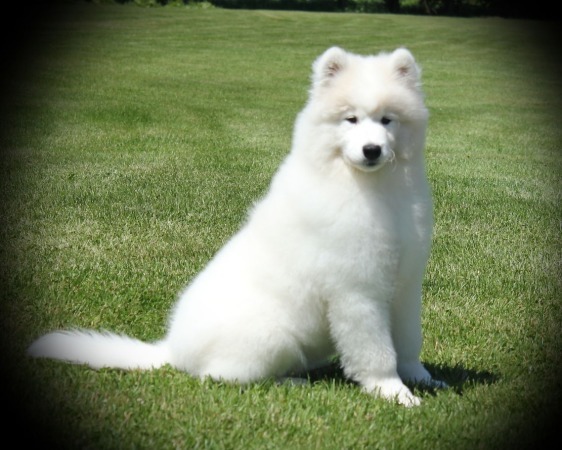 Our puppies have a written guarantee that both their sire and dam are clear of any hereditary or congenital birth defects. 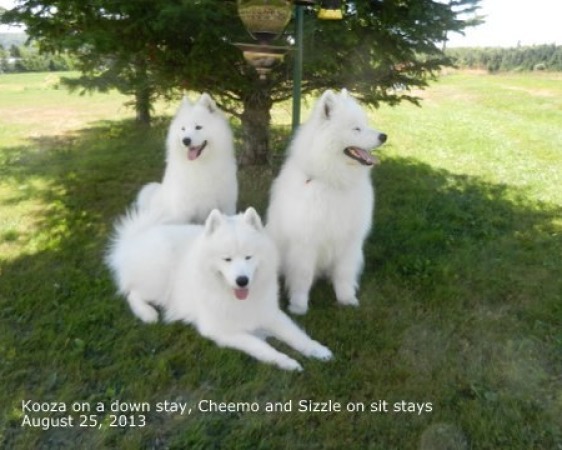 Snowstar dogs are registered with the Canadian Kennel Club (CKC), have been microchipped with CKC approved chips and have had their first set of vaccinations and vet checks. 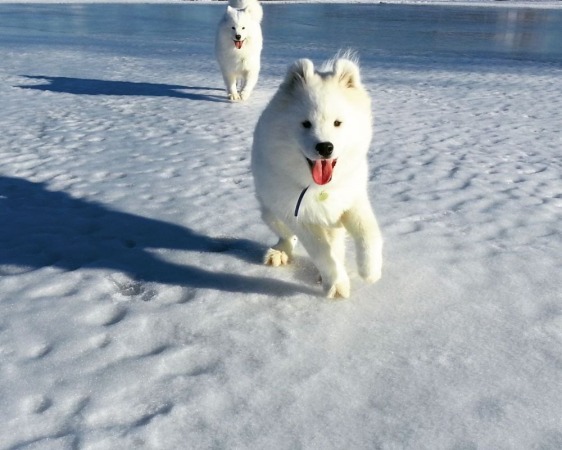 Puppies are covered by the CKC sponsored Pet insurance program - Pets Plus Us for the first 6 weeks after they leave Snowstar, at no cost to the new owner. 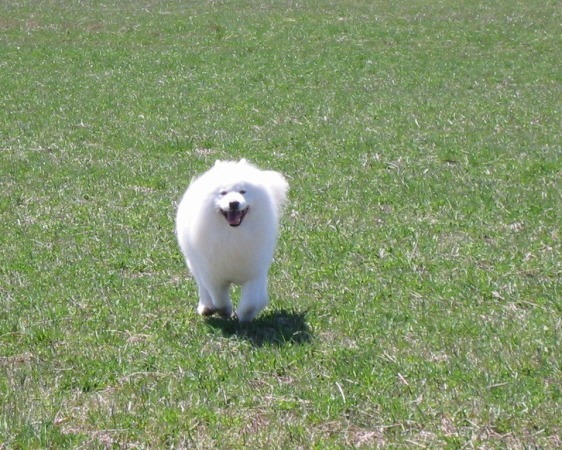 All companion dogs are sold on a Non-Breeding Agreement which means they may not be bred. 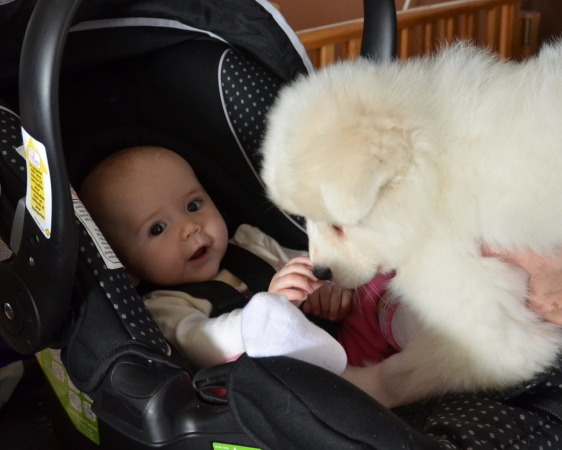 Our relationship with the new puppy owner does not end when the puppy goes to their new home. We are always available to offer support, encouragement and advice when needed. 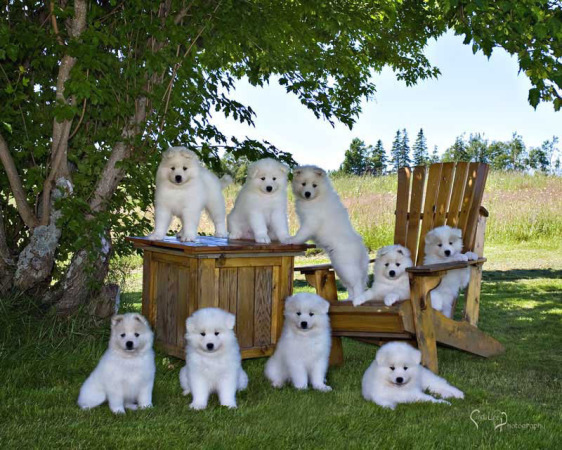 We strongly believe that we have a responsibility to the puppies we produce for their entire lifetime. 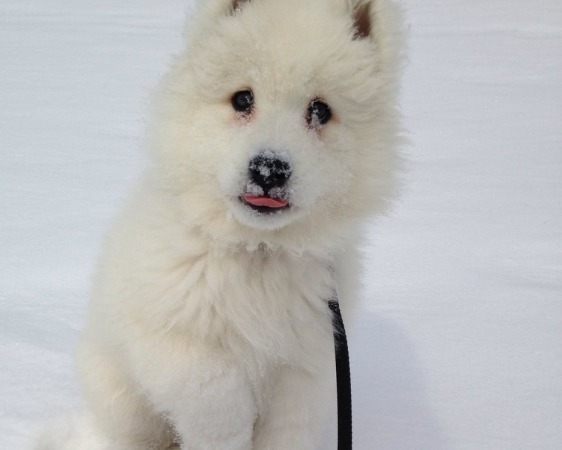 There is never a reason for a Snowstar puppy to be placed in a shelter or rescue...we will always be available. 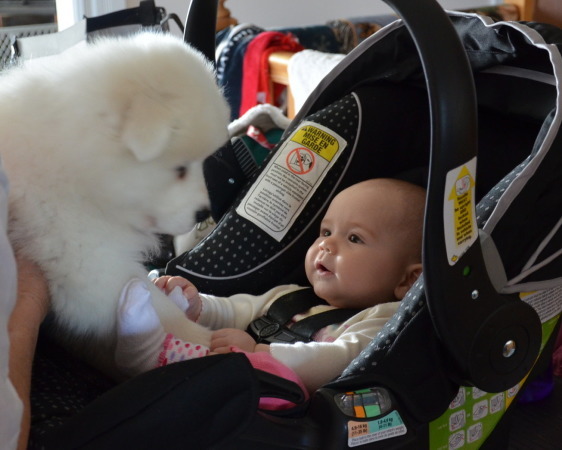 In fact, our contract states that we be advised if situations in the home change or the dog needs to be returned. 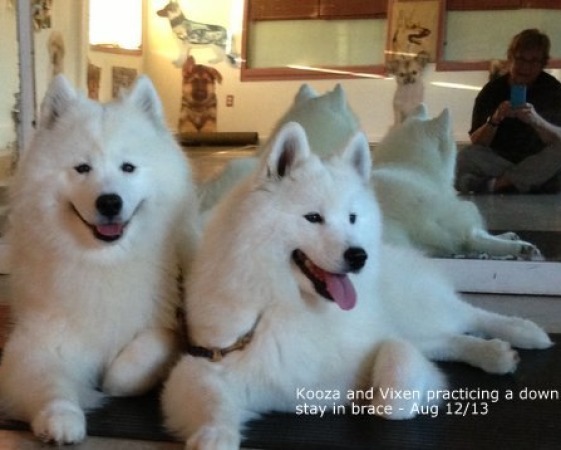 As a breeder of these wonderful dogs we stress the importance of health checking. 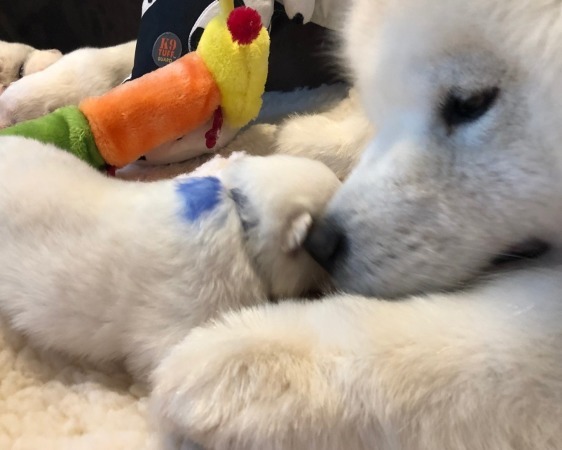 Prior to any breeding we ensure our dogs are properly health tested (vet check, hips and eye certification) to help us ensure that we are breeding sound, healthy Samoyeds. 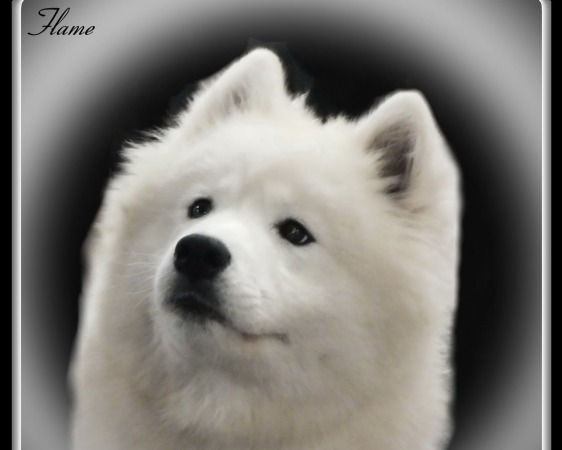 Please feel free to email or phone us at any time if you have any questions about our dogs or the Samoyed breed in general. In the very early days, men with their herds roamed the plateau of Iran and lived off the land. Property ownership did not exist; the land belonged to all in the beginning, and then later to the swift and the strong. As mankind increased and separated off into families, tribes of kinsmen had an ever-increasing need of more and more grazing land for their herds, (reindeer was the common herd animal at that time). 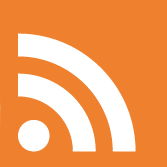 Family groups and tribes often drifted off, or were forced off, to farther pastures. 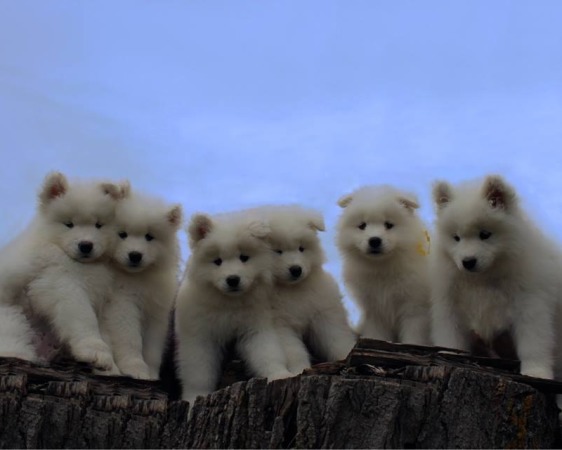 Through the centuries this process continued across Mongolia, and farther and farther north went the tiny nomadic tribe we now call the Samoyede people - until at long last they arrived at the farthest reaches of northern Siberia, between the Yenisei River and westward to the Petchora River in Russia. Here was a haven, fortressed by Nature's own walls of ice and snow. 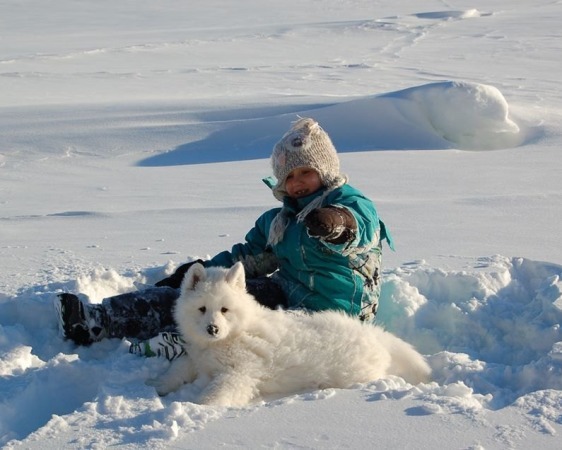 And here the Samoyede people with their beloved dogs and reindeer herds remained for centuries before the Christian era. 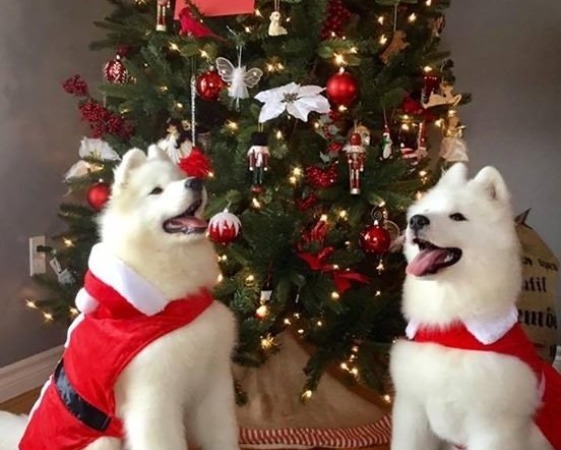 Here, in this place of peace and plenty, the gentle Samoyed breed that adopts their name from the very people they followed to the ends of the earth, shared their master's bed and home, feasted and starved even as he did. His working role was to hunt, herd reindeer, and haul sledges in keeping with his peoples nomadic lifestyles. 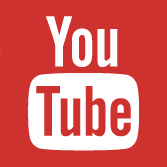 Then into this primitive world came the inroads of civilization. 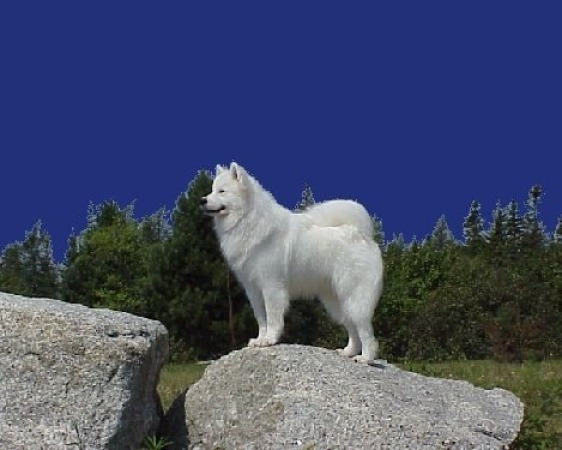 In 1870 stories leaked to the outside world of the peaceful Samoyede people and of their dogs - hidden like the diamond, for so long from the world at large. Specimens were purchased by explorers for Arctic and Antarctic expeditions. 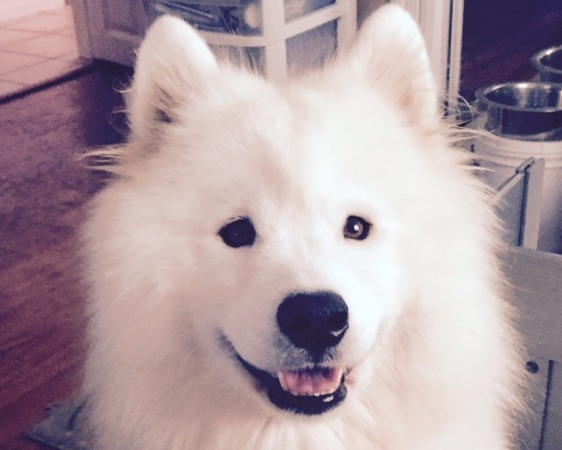 A handful of these dogs found themselves in England after their expedition duties. 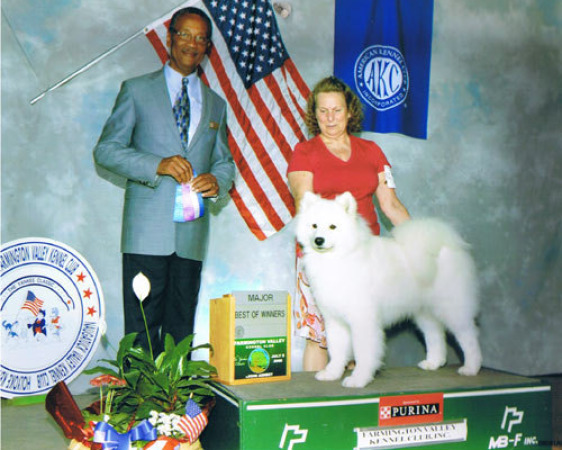 There Ernest and Clara Kilburn Scott are credited with bringing Samoyeds before the English public, and both promoting and developing the breed. 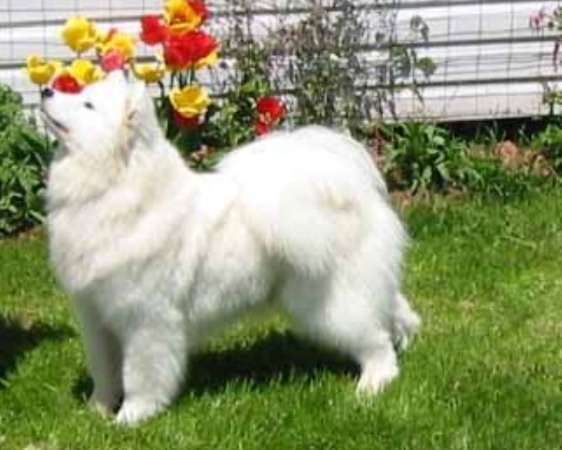 The striking beauty and tractable temperament of the Samoyed made it a popular choice as a companion in America as well. 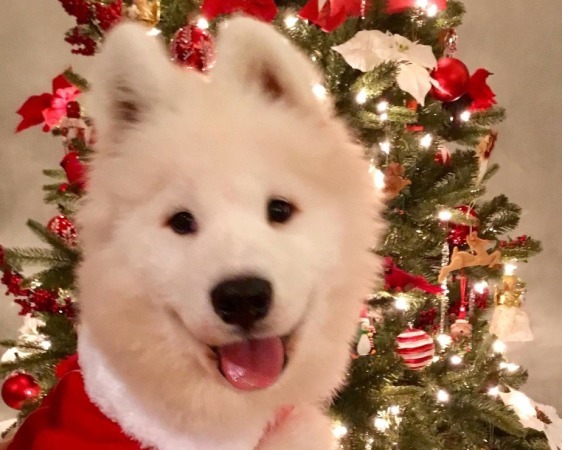 Today the Samoyed is a well loved and recognized breed worldwide, owing its discovery within the western world to its rich and noble working heritage - and enduring love for mankind. 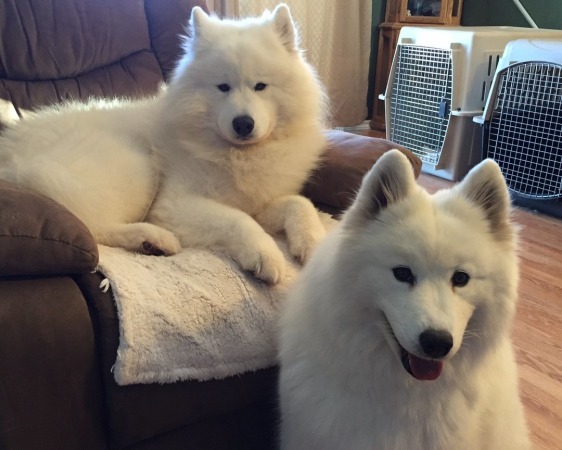 Living With a Samoyed - Understanding the breed "first"
No one breed is the ideal for every person, family or situation. 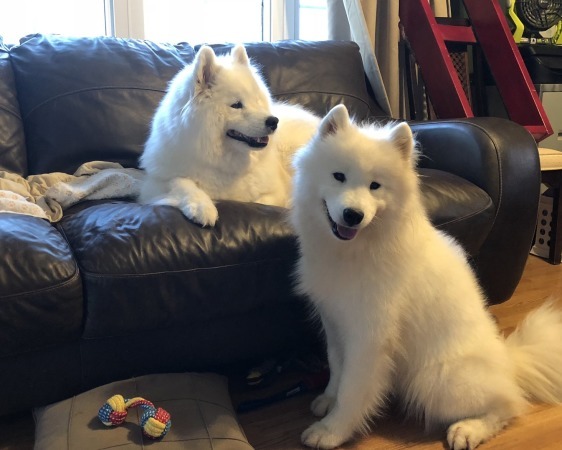 Learning about and understanding Samoyed breed traits, and thoroughly examining ones own lifestyle must first be done to ensure a harmonious meld. 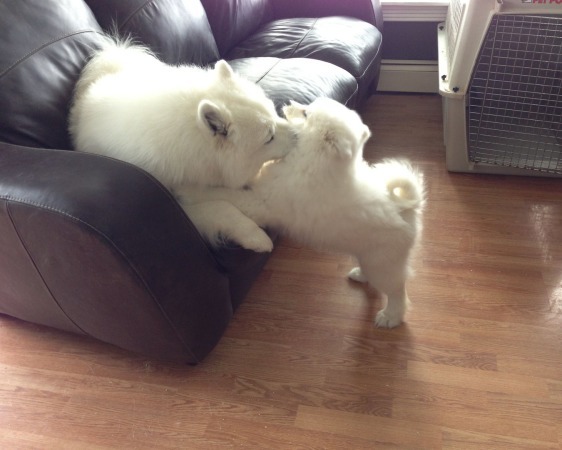 This is an essential step for any human/canine union to encounter success. 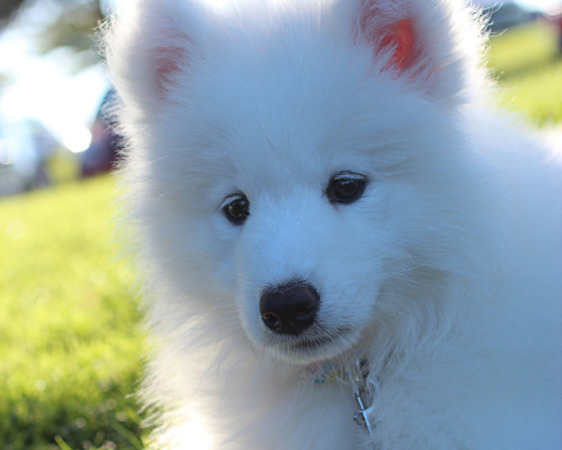 The Samoyed is a medium sized (19-21.5" females; 21-23.5" males), social dog with a strong sense of "pack". 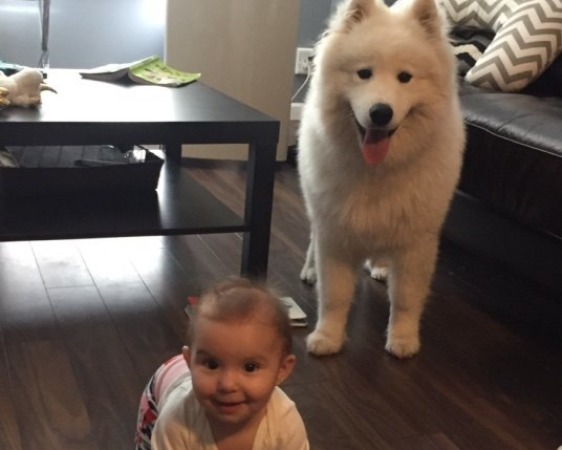 He takes well to families large or small; with or without other pets. 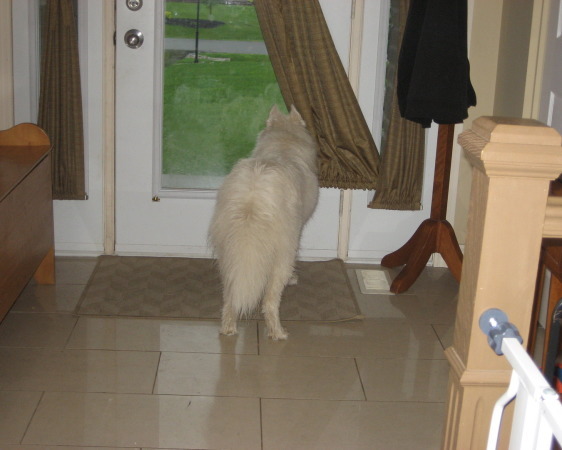 Because of his social nature, he should not be expected to endure long periods of isolation without complaint. 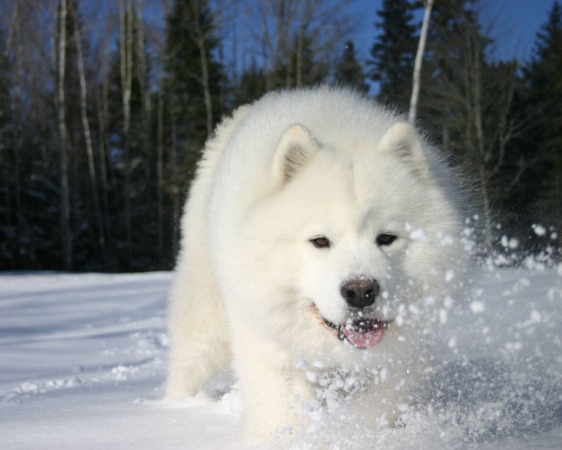 A lonely Samoyed can be a noisy and destructive Samoyed. 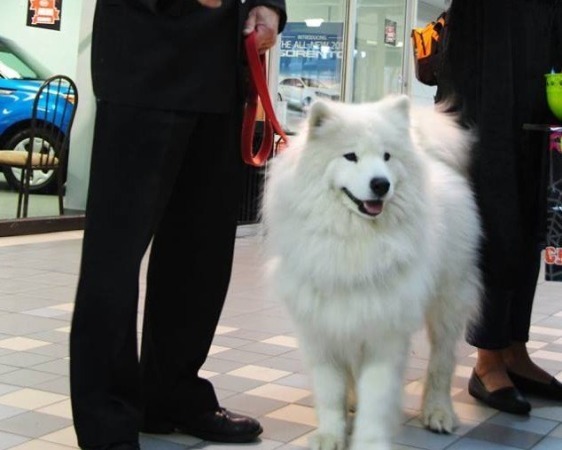 And please do not rationalize that because he carries a heavy coat, he should be relegated to "outdoor dog" status. 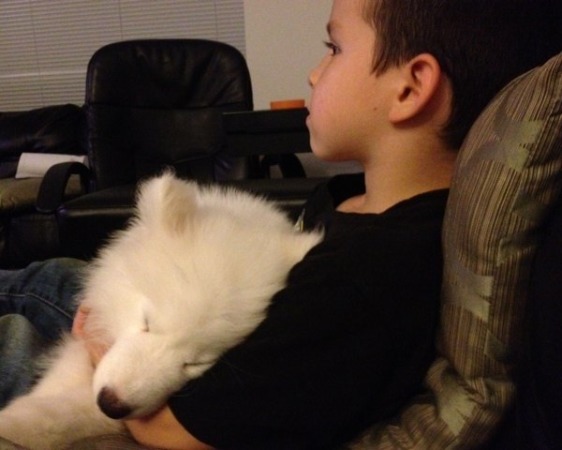 A Samoyed will ALWAYS want to be where YOU are. 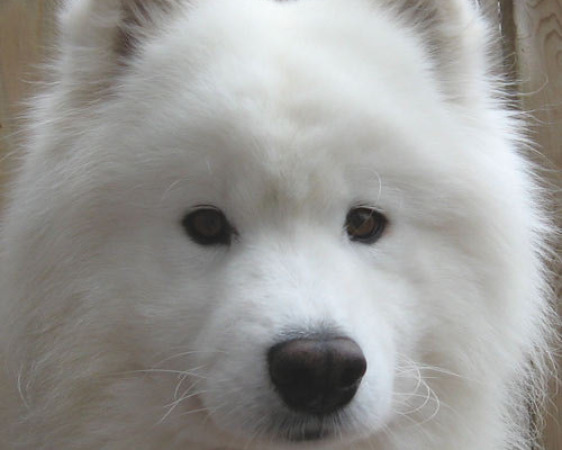 Despite his arctic heritage, Samoyeds have adapted quite well to warmer climates. 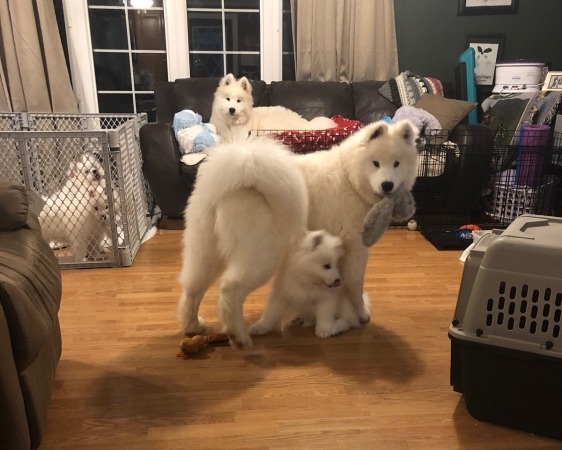 Not naturally a bothersome or demanding dog, he will exhibit great contentment and pleasure simply by being close to his 'pack'. 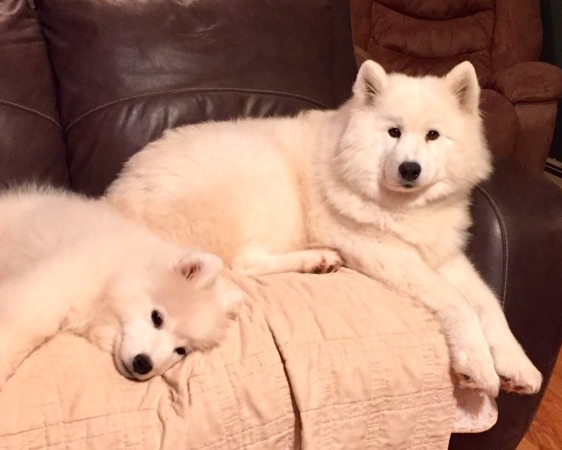 Care, however, must be taken in the early training of any breed to ensure that the humans are the unchallenged 'pack leader', to enjoy an obedient and happy pet who accepts authority. 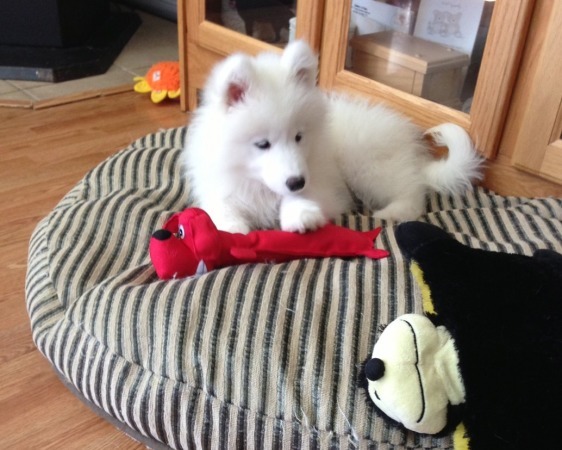 Obedience and puppy socialization classes should be strongly considered for any puppy's benefit, and the Samoyed is no exception. 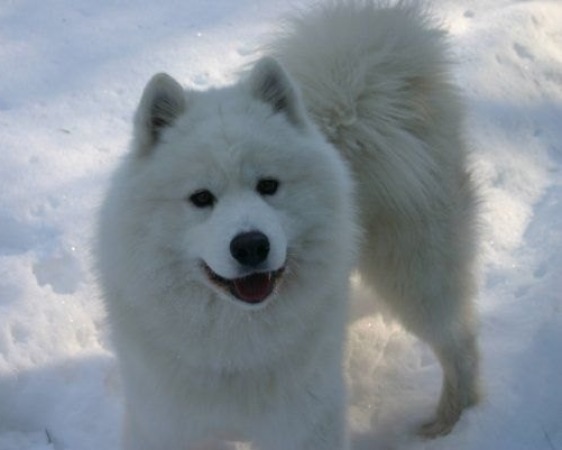 Charming, intelligent, active and playful through old age - the 'Sam' is amazingly comical, while thoughtfully sensitive. 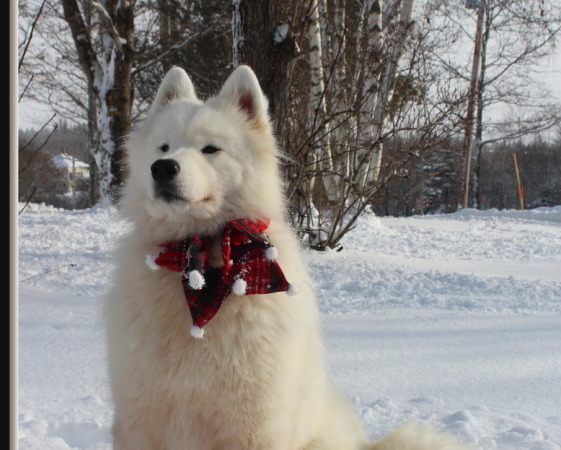 Samoyeds possess a white, biscuit, or cream double coat - an outer-coat of harsh, straight guard hair for protection against the weather, and a downy, soft undercoat for warmth. 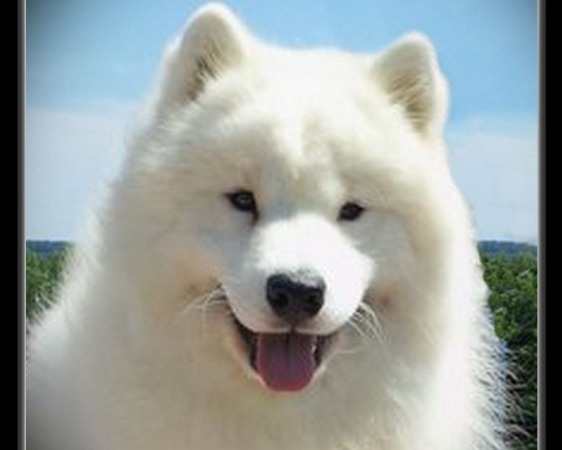 Contrary to popular opinion, the Samoyed is NOT hypoallergenic. 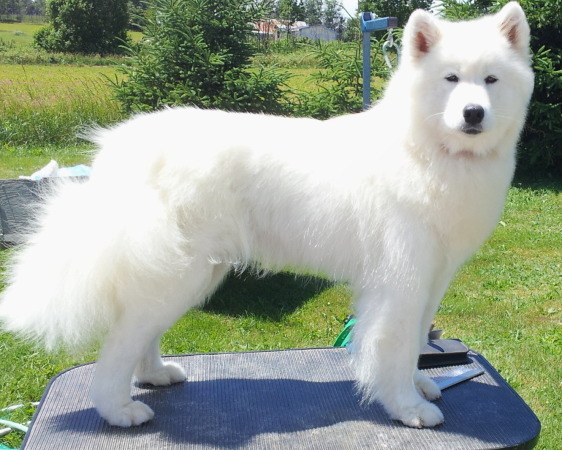 Grooming requirements are not onerous, but they are regular and must be thorough to retain both the dogs comfort and beauty. 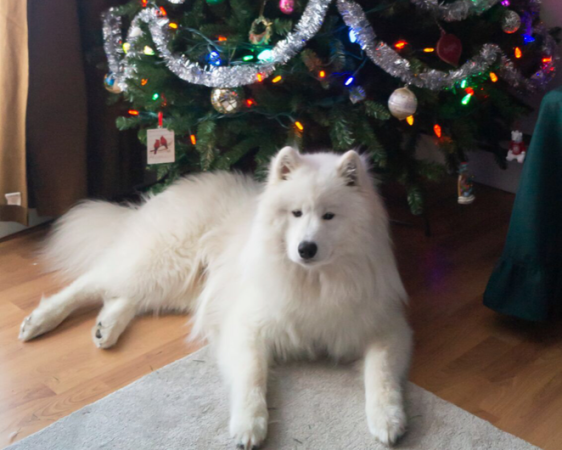 Shedding of the undercoat is seasonal, and part of life when one owns a Samoyed. 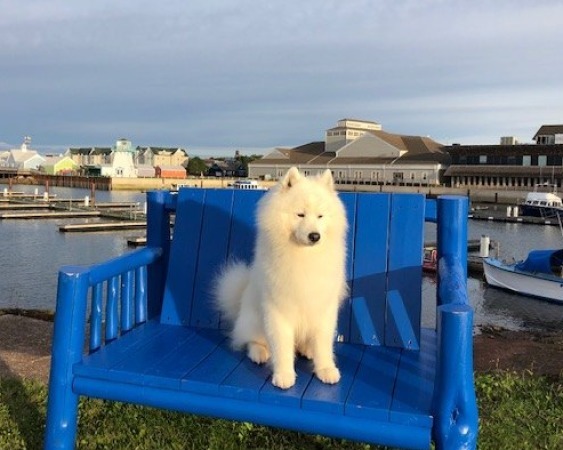 Sun and moisture are the enemy to the Samoyed's coat, and care must be taken to prevent the damaging effects of the elements through thoughtful housing. 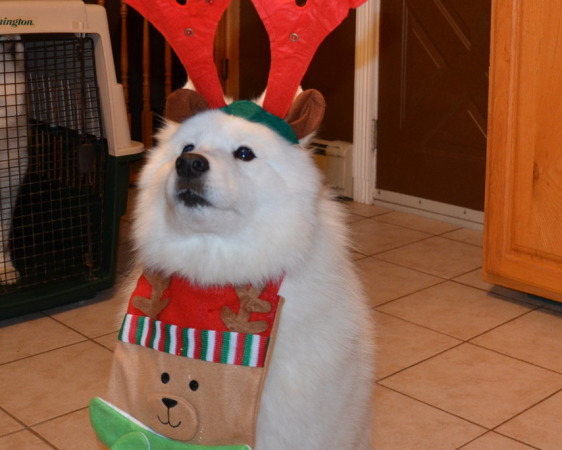 Samoyeds are not natural guard dogs. Their friendly nature often make them neighborhood favorites, and it is likely they would greet a thief with almost as much exuberance as they offer those they know. 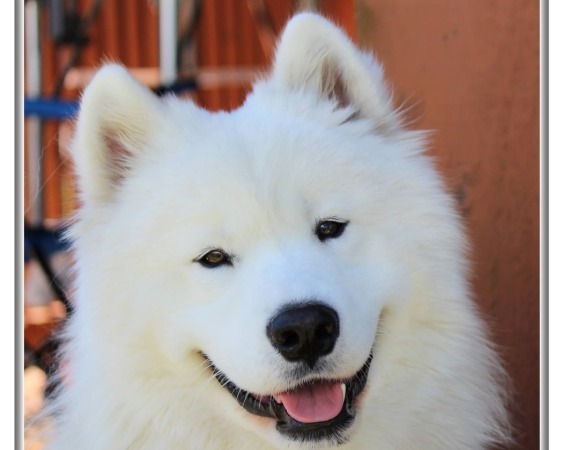 This is one of their most beloved traits however, and fanciers treasure the faithful and loyal smile that greets them every time they come home. 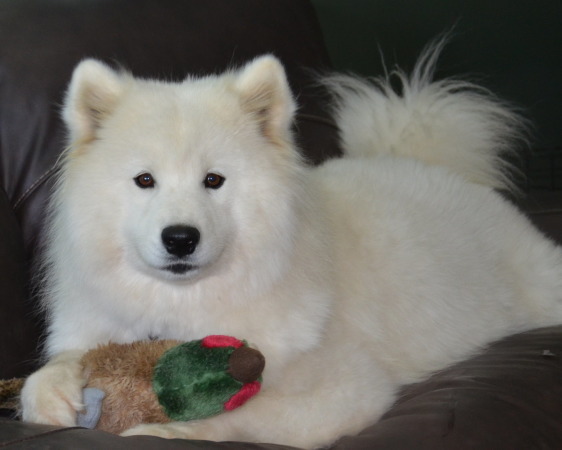 No toy or miniature versions of the Samoyed exist. 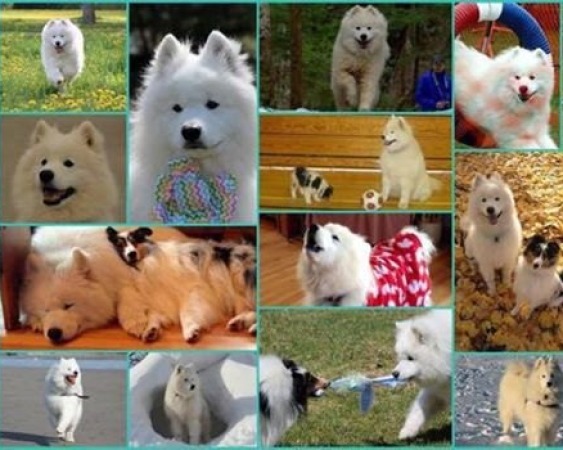 Although there are breeds that bear physical resemblance - the treasured Samoyed nature remains exclusive to itself. "We'd always find somewhere to bury our troubles. Our spirits would be unleashed. We'd stop barking up the wrong trees. We'd always paws for reflection. 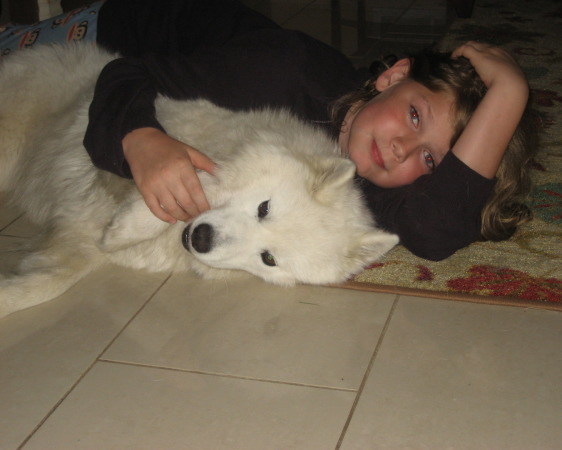 We'd have faithful friends and loyal love. We'd give a lick about each other."